This 19-story apartment building was designed in 1940 by Sylvan Bien. It is distinguished by its very handsome, circular rooftop watertank enclosure. The red-brick building has a four-story stone base, and some of its upper terraces have stone cornice lines and the building's top floor has attractive pediments. The building is directly across the avenue from 740 Park Avenue, one of the city's most prestigious pre-war apartment buildings and it is half a block north of the prestigious Asia Society. It has a canopied entrance on the avenue where its frontage is quite massive, but its sidestreet facade has several piers that modulate its mass, which is also punctuated by protruding window air-conditioners, a good example of how such "punctuation" can in fact be attractive and add considerable visual interest to a large bulk of a building. The building's location is prime Upper East Side as it is two blocks from the Corrado cafe and Swifty's restaurant on Lexington Avenue and two blocks to the east of the Frick collection and one block east of the boutiques on Madison Avenue. There is a local subway station at 68th Street and Lexington Avenue where is also where Garnet's, one of the city's most famous liquor stores is location. In their great book, "New York 1930, Architecture and Urbanism Between The Two World Wars," Robert A. M. Stern, Gregory Gilmartin and Thomas Mellins noted that Mr. Bien "preferred a kid of abstracted red-brick Georgian aesthetic for his nineteen-story 737 Park Avenue of 1940 as did George F. Pelham Jr. for his 785 park avenue of 1939-1940." 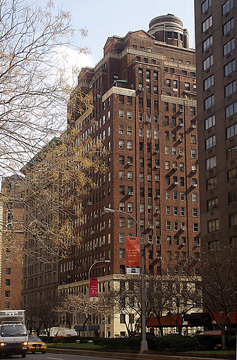 Other buildings by Sylvan Bien included 605, 710 and 1199 Park Avenue, 860, 922 and 1050 Fifth Avenue, the Schwab House on Riverside Drive at 73rd Street and 11 East 86th Street. Buildings designed by him and his son, Robert, include 900 amd 910 Fifth Avenue, 35 Park Avenue, Stewart House Apartments, and 110 William Street. In an article entitled "There's Nothing Wrong With White-Glazed Brick Buildings" in the December 31, 2000 edition of The New York Times, Christopher Gray wrote that "The white-brick apartment house of the 1960's seems to be at the nadir of fashion, as lobbies, sometimes even whole facades, are being revamped to look decades older." "But like the last Confederate soldier, there is Robert L. Bien, who entered the architectural profession at the knee of his father, Sylvan, designer of the Hotel Carlyle, built in 1930. At 77, the younger Bien is still working, but he has a low opinion of the retro-traditional style: ''It's just a yuppie fad - there's nothing wrong with white-glazed-brick buildings," the article continued. According to Mr. Gray, Sylvan Bien worked for Warrent & Wetmore and Emery Roth in the 1920s and Robert Bien graduated in 1949 from the Cornell College of Architecture, ''where I was in the last class to be trained in the Beaux-Arts tradition,'' he said. "Sylvan Bien started his career during the period of historic styles, but by the 1940's he was designing buildings like the Moderne-style Godmothers League, at 255 West 71st Street, and the simple, boxlike Schwab House at 73rd Street and Riverside Drive. The son joined the father's firm in 1950, and in the 1950's they designed buildings that fell squarely into the simple boxy look of the period. One that Robert Bien looks back on fondly is the white-brick 900 Fifth Avenue, at 71st Street, with two projecting bays. The building is set back a few feet from the property line, and the two bays are unusually expressive in a period of pared-down expectations. 'The owner wanted it to be classy and unusual,' Mr. Bien said. On the other hand, he sees 910 Fifth, at 72nd Street, as 'one of plainest buildings we did - there's no detail, nothing special about it,' he said. The developer, he said, pressured the Biens to reduce costs. 'Half of architecture is the client,' he said." He does note, however, that the broad windows in the building give much better views and let in more light than those of the prewar structures, like 907 Fifth Avenue, across the street. With a client interested in the design, Mr. Bien said, he had a freer hand. One such client was the developer Thomas Frouge, for whom Mr. Bien designed 1 East 67th Street, at Fifth Avenue, in 1961, after Sylvan Bien's death in 1959. That building is anything but plain, with all sorts of bays, insets and a series of wavy, undulating piers. ''At the time I thought, 'Let's liven it up,' '' Mr. Bien said. At 1 East 67th Street, Robert Bien designed an apartment buidling for Thomas Frouge with undulating piers that were originally pink but subsequently painted white, and an office building he clad in red at 40 East 52nd Street was later painted gray. In his obituary in the June 1, 2002 edition of The New York Times, Eric Pace noted that Robert Bien was the architect with his father, Sylvan Bien, of the office building on Lexington Avenue and 51st Street in 1958 that was the first use in the city of gold-colored anodized aluminum for Sam Minskoff & Sons. The building was subsequently toned down in a recladding some years ago. In her "Between the Bricks" column in The New York Post February 23, 2011, Lois Weiss wrote that "a prewar building at 737 Park Ave. is coming to market for the first time in 65 years and could fetch as much as $250 million," adding that 737 Park Avenue is "opposite two of the city's premiere co-ops, at 720 and 740 Park Ave.
To get the pricing that the Katz family sellers insist on, the article continued, "this building, with units that average over 1,800 square feet, will have to become a condo conversion," adding that the building has108 apartments of which five are professional suites on the ground floor and about 70 percent of the apartments are paying market rents with the remainder rent stabilized. The article said that the Katz family also owned 530 Park Avenue. Harry Macklowe, the developer whose firm's implosion came to epitomize the real estate crisis, has entered his third deal in eight months, signing a contract earlier this week to buy the pre-war apartment building at 737 Park Avenue, sources said, according to a May 5, 2011 article at crainsnewyork.com by Theresa Agovino and Amanda Fung. The developer, along with an equity partner, is expected to pay $250 million to $255 million for the highly-coveted property on the northeast corner of East 71st Street, the article said, adding that "Mr. Macklowe plans to convert the units into condominiums, sources said. The identity of the equity partner could not be immediately determined." "Sources said numerous bidders competed to win the 108-unit property, which is seen as one of the few pre-war condo conversion opportunities left on the storied boulevard. Currently 70 percent of its apartments are market-rate and 30 percent are rent stabilized," the article continued. 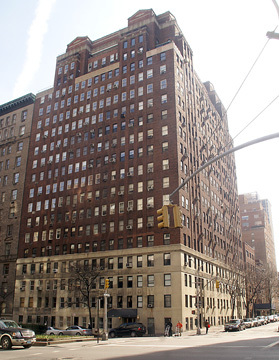 The deal follows reports last month that Mr. Macklowe is buying another pre-war rental building in the neighborhood - a property at 150 E. 72nd St., off of Lexington Avenue - for $70 million. He also plans on converting that property to a condo, sources said, the article noted, adding that "mMore recently, the developer, along with partner Prudential Douglas Elliman Chairman Howard Lorber, snapped up a defaulted loan on 953-961 First Ave., between East 52nd and East 53rd streets." "After losing almost his entire real estate empire in a spectacularly bad real estate bet four years ago, Mr. Macklowe has been on a tear. In January 2010, he teamed up with Los Angeles-based CIM Group to pay off to investors a $510 million loan on the former site of the Drake Hotel at East 57th Street and Park Avenue, published reports said. Back in 2006, Mr. Macklowe bought the hotel and subsequently demolished it. Deutsche Bank started to foreclose on the property in 2009. It's unclear how much, if any, equity Mr. Macklowe retains in the project, but published reports say Mr. Macklowe and CIM are moving forward to build a new skyscraper on the site."